A tank leads a military convoy through a field of red poppies. Red stars appear on the sides of the tanks and transports — impossible to miss in the dull green. In a bunker nearby, glowing red eyes track the vehicles’ progress. A small light runs along the edge of a black box next to the glowing eyes, when a sizzle fills the air. A laser blasts from the box into the side of the convoy. A troop transport explodes under the laser fire, then a jeep. The tank puts a round into a bunker, but it’s too late. The glowing red eyes fire the lasers into another transport, another jeep and finally the tank. All explode, the fireballs tossing bodies from the vehicles. The charred bodies of soldiers smolder on the ground. One soldier rolls over, revealing itself to be a mannequin. The camera pans across the wreckage of the convoy, lingering long on the burning non-flesh of the models which stood in for the soldiers. This is the opening of the 1986 family film Short Circuit. I watched Short Circuit roughly 500 times as a kid. Every day the Disney Channel ran a movie at noon, and during the summer, I made damn sure I was in front of the T.V. ready to absorb whatever feature film Walt had in store. In addition to the typical animated fare, the Disney Channel aired a lot of live-action family films of the broad and generic type. It played the Shaggy Dog series, the adventures of Herbie the Love Bug and, of course, Short Circuit. I sat through the adventures of Johnny 5 repeatedly. But for all the repeated viewings, I did not recall many of Short Circuit’s more horrible aspects, such as Fisher Stevens browning up to mug an East Indian accent and deliver terrible jokes, the implication that killer drones were around the corner and the lazy, fatalistic attitude toward thermonuclear Armageddon. The film comes from a completely different world than the one we live in now, and the magic of Short Circuit and its hero — Johnny 5 — has become our reality. We’ve got robots now that look a lot like Johnny, and they’re killing people. Short Circuit is a family film, but it takes its sweet time getting to the slapstick bits I remember watching with glee as a child. After the killer drones finish wiping out the mock-communist convoy, the generals clap and the roboticists in charge wheel the drones offsite for recharging. While the fifth droid sleeps, lighting strikes the generator, frying its circuits and granting it sentience. Number 5 wanders off the robotics facility, stumbles into Ally Sheedy’s life, learns to read, learns what it means to be “alive” and befuddles its designer played by Steve Guttenberg. In the end, Johnny 5 escapes the military and the defense contractors who want to make him a weapon of war. The final scenes imply that Johnny will live a long, fully, happy life on a farm in Montana with Gutenberg and Sheedy. 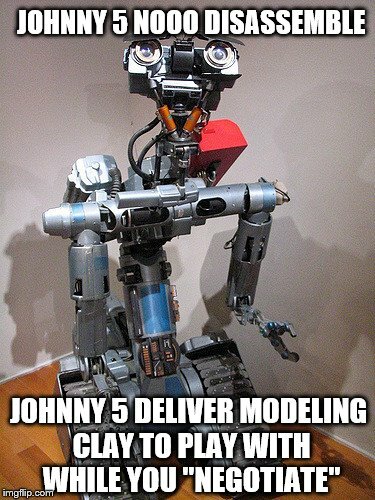 But it takes Johnny 5 about 20 minutes to hook up with Sheedy and start the madcap portion of his adventure. Before that, it’s all cruel men in suits gabbing with generals about war and death. I guess I ignored that as a kid, or the Disney Channel cut it out. The defense contractors call Johnny and his fellows SAINTs, for “Strategic Artificially Intelligent Nuclear Transports.” That nuclear part is important. Judging by the conversations between the “warmongers,” as Sheedy calls them, the Pentagon wants Johnny 5 and his buds to add a new angle to the nuclear triad and make it a nuclear quadrangle. “If survival is the question then SAINT is the answer,” a general tells a visiting senator. It’s as if nuclear war was a given, and that America’s only hope was to screw the Russians as hard as they were going to screw us. That’s some dark and subtle comedy for an ’80s kids movie. It flew over my head as a 10 year old, thank God. By the early ’90s, nuclear weapons were something for parents to worry about — not children. Guttenberg plays the reclusive genius who invented the droids. He’d rather have them serve drinks. At one point he tells a general he’d invented the thing as a marital aid. It’s a complicated robot to bring into the bedroom, but different strokes for different folks. So, the robot that would steal America’s heart and take on New York City in a sequel two years later, began life as an $11 million nuclear warhead delivery service. Something meant to roll from its hiding space only if Russia rendered the United States into a nuclear wasteland. A “gotcha last” weapon. A child of four could tell you that’s fucked up. I enjoyed rewatching Short Circuit for the first time in decades. It felt familiar and good, but its bizarre elements stand out more now, and Johnny 5 is harder to love. There’s been talk of a reboot over the years, and I wonder how they’d play the military angle. Better to drop it, I think, and let Johnny 5 be a domestic servant or toy that gains sentience and learns to love. Because these days, America fields a fleet of flying assassin droids and my local police department recently used a robot that looks remarkably like Johnny 5 to blow up an active shooter. Johnny has made a recent comeback as a killer meme. Short Circuit ends with a hopeful note. The robots, we’re told, could be just like us — they can read, learn to dance like John Travolta and cook us pancakes. All we have to do is shoot them with lighting and give them a chance to prove their sentience. But the future is now, the robots are here and we designed them to kill. The gods of family-friendly films won’t be sending down lighting bolts to turn bad robots good. Or, rather, to turn a weapon into a master chef. Ours is a world that would horrify Johnny 5 — a world that looks much more like than the film’s first 20 minutes than its last hour. The only thing more uncomfortable than the flaming horror show of Short Circuit’s opening scene is Fisher Stevens’ performance as walking stereotype Ben Jabituya. Truly, 1986 was a simpler time, when nuclear war loomed over children’s robot comedies and a bad Indian accent screwing up American idioms was still funny.